Kevin Hart getting ready to put a ring on it! 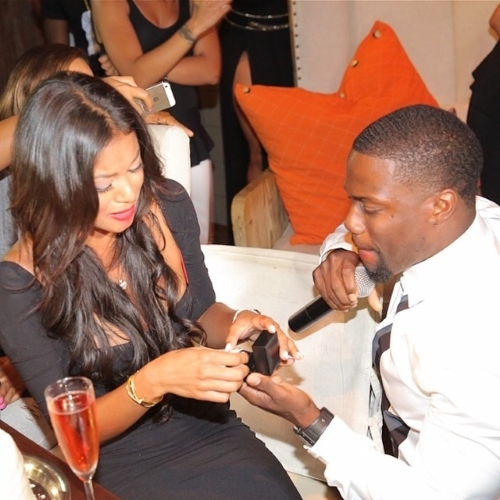 *Kevin Hart proposed to his girlfriend Eniko Parrish on Monday night during the premiere of “Atlanta Exes,” which his ex-wife Torrei Hart is featured on, and critics came for him. Hart, of course, blasted right back at his critics — saying he chose to propose to his girlfriend during a special time for them, and it had nothing to do with ex-wife. Fans and critics on the Instagram page of the comedic actor called him out as being shady for proposing during his ex-wife’s time to shine — claiming he did it to hurt her. But he denied it. But none of the hate has stopped Hart and Parrish from celebrating their love and engagement — especially as Hart shared photos on Instagram from the bash.